Taken around this time last year, I remember exactly when I captured it. This was taken after the first day we had come back from San Diego. 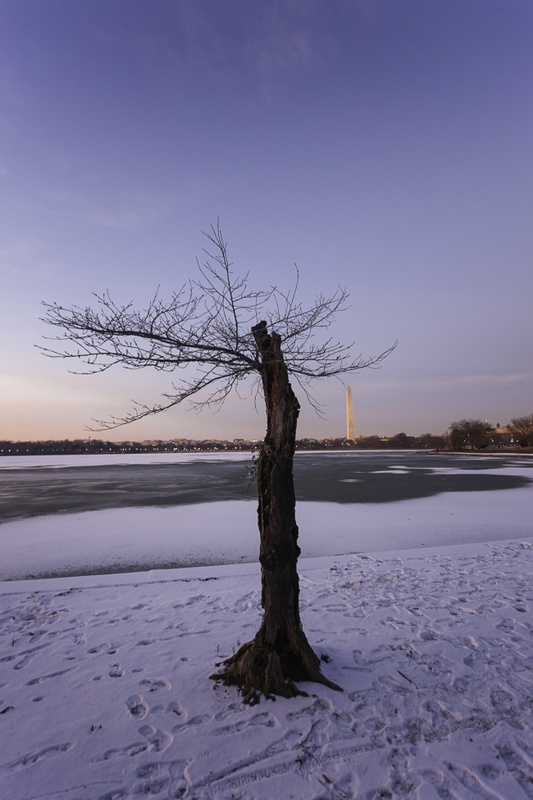 While we were gone, the Washington DC area had gone through this insane cold snap. I remember getting texts from my friends all saying that they were going to come to San Diego because it was like 15 degrees below freezing or something crazy like that. While we were in San Diego, it was colder than usual but nothing like it was on the east coast. 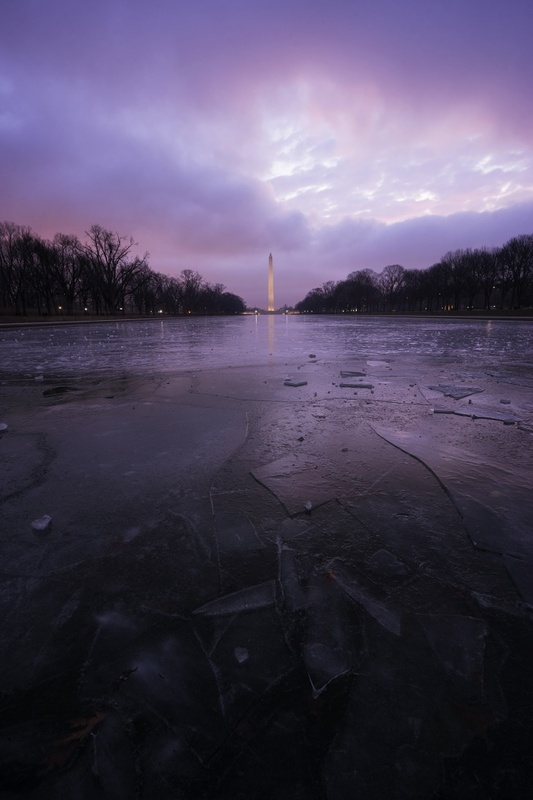 It was so cold that the Reflecting Pool had frozen over. It was so frozen that I saw people walking across it! I must admit I was a little jealous of the opportunity but was even more grateful to be in southern California. So feeling the fomo, I went down to the reflecting pool as soon as I could. I was glad to see that it was still frozen over because it made for a cool photo opportunity but the cracks in the ice did not give me the confidence to actually walk on it. In order to capture this image, my camera was practically on the ice so I could get as much of it in the frame as possible. I remember really wanting to concentrate on those little ice chunks on top of the ice. It was so interesting to me. My camera settings for this image is F9 at 1.3 sec and ISO 250 with my Sony A7II and 16-35mm wide angle lens handheld. We left to California at the right time. 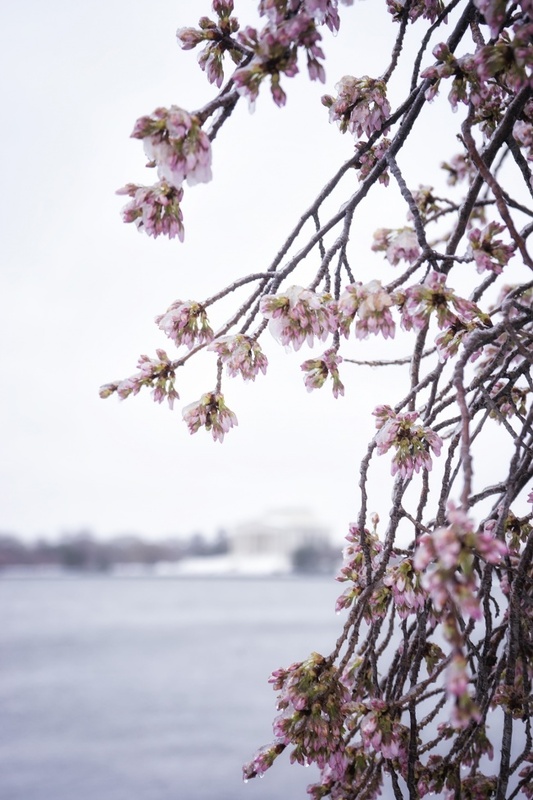 As soon as we left, Washington DC experienced a serious cold snap. My parents and friends were texting saying how they were going to come find us in San Diego because it was just so back home. I’m talking single digits with wind on some days. I felt so bad for them while I was sitting on our Airbnb’s patio staring at orange trees in 75 degree weather. LOL. But in all honesty, I was a little jealous. With extreme weather like that you’re going to get some awesome pics. 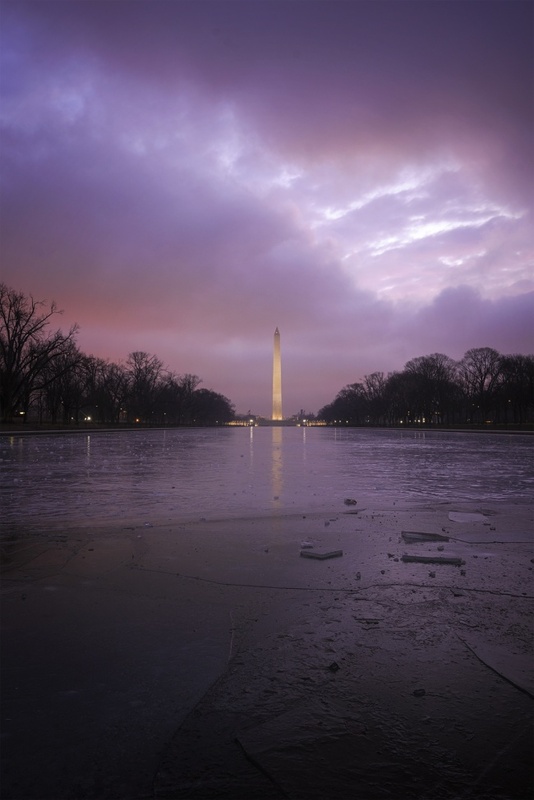 I saw so many of my instagram friends posting some really unique images like people walking on the frozen reflecting pool. What the what? I want to walk on the reflecting pool! That looks so cool. I even saw someone riding a bike and ice skating on the reflecting pool. That’s crazy! If I had ice skates, I’d be allllll about that. Triple axels and everything! HAHA JK. The most I can do is go backwards. So when we got back, I was really hoping to get a little taste of it. 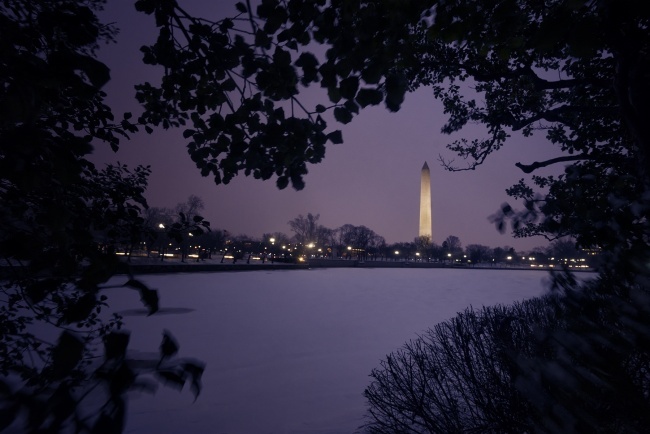 I woke up yesterday knowing that my first sunrise back in DC had to be the Reflecting Pool. When I arrived, I was so excited to see all the ice chunks but I didn’t dare step on it because I wasn’t sure if it was still safe or not. Look at me being all cautious in the new year. LOL. My camera settings for this image is F10 at 2 seconds and ISO 250 with my Sony A7II and 16-35mm lens on my gitzo tripod. What’s crazy about Rock Creek Park is that you can’t believe this place is actually in DC. Growing up, I always thought it was dangerous. I think it’s because anytime you saw anyone going to Rock Creek Park in the movies it was always to do something bad. Like a dangerous drug deal or the exchange of some top secret government information (thanks House of Cards). To be honest, I’ve never felt like I was in danger while I was there. Its probably one of the most beautiful places you can be inside of the city. Obviously the best time to go is in the fall time but even in the middle of the hot, humid summer, you can find a some peace. To take this image, I did not use a tripod. I just used my Ice 10 stop neutral density filter and balanced myself on some rocks in the middle of the stream. I then held my breath for as long as I could so I could create these streaks in the water. 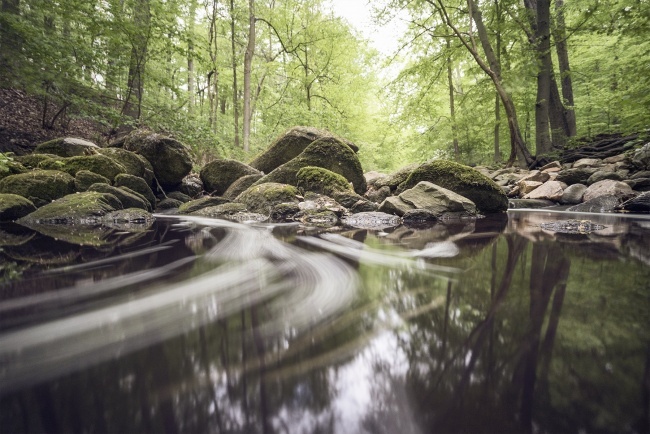 It’s super important to stay as still as you can while capturing these long exposures. If you move, then the image may turn out blurry. The water flows pretty fast so I didn’t have to wait long. I believe this is about a 10 second exposure. Getting down low and changing my perspective really adds a lot of interest into these kinds of images. The streaks in the water turned out to be one of the most predominate parts of this image. It probably wouldn’t of been the same if I were higher and on a tripod. Another one of my favorite parts is the reflection of the trees. Love it. By the way, when is House Cards coming back on? I can’t wait to see what happens with Claire.